Categories: Mini Guitar Series, Travel Guitars, Theme Guitars. Tags: acoustic, b-burst, bob, burst, custom500, electric, excess, fender, fishbone, gibson, guitars, hello, horse, j200, jem, kitty, lp, strap lock, strat, tele, trem, voodoo, white horse. 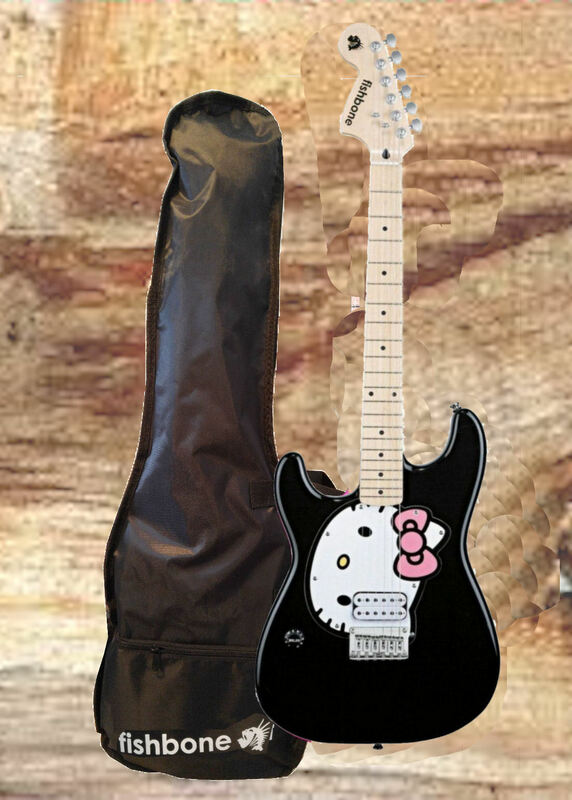 Hello Kitty Stratocaster guitar! Features include a maple neck and 21-fret fingerboard, humbucking bridge pickup, chrome hardware, single volume control, Hello Kitty logo and graphics The purr-fect guitar for Hello Kitty fans! This is a 3/4 size (actually playable) guitar with Hardtail (no tremolo) and single humbucker pickup.